« BookGlutton Homepage – NEW! Check out the healthy helping of customization we’ve added to Groups. Now you can upload a profile image for your Group – isn’t a picture worth a thousand words, after all? Also, we’ve taken a page from profiles – now Groups have their own wall. 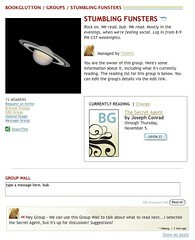 Leave a note on the Group Wall about what to read next, or when to read, and even who else to invite. Wall postings generate an email to the rest of the Group members, so you can make plans. Log in and hit your Groups link in the header to start using this today.